Instagone Pro blasts stains away on contact, giving you hands free cleaning without any scrubbing. The instant cleaning secret to Instagone is the penetrating action that works into the deepest and tiniest crevasses that blasts stains on contact. Clean any surface, hands free, while standing up in seconds. This is a multi-purpose stain removing spray; It works well on rust, mold and other stubborn stains. There is no wiping or scrubbing needed; Just spray it on and the stains will be gone. It is super concentrated. 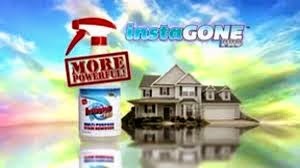 InstaGone is the best way to get rid of mold, mildew, water spots, grime, tatar and other stains. Works on many types of ceilings including ceiling tiles and popcorn ceilings. You can even clean caulking, plaster, stucco, tile, masonry, PVC patio furniture and so more. You can clean so many items and surfaces with this cleaner. Clean tile, stucco, painted walls, outdoor furnitures, ceilings, concrete, mold stains and mildew stains. It is so easy to use this product. Just point and spray and instantly see the stain, dirt or grime disappear. Has been known to be great for removing ceiling stains. Pretty good that you can just squirt without scrubbing and wath those ugly stains go away! Clean just about any surface in your home, hands free, in a few seconds! Get rid of water stains on stucco instantly. Bring that old weathered outdoor decking and dirty looking patio furniture back to life. Order InstaGONE Pro and a spray bottle!